Our goal is to improve and preserve the health, economy, and social well-being of families and communities, through the provision of small grants for projects. Our special interest is maize agriculture, its socio-cultural context, and the role of traditional knowledge. In part, because current evidence suggests that the Oaxaca region is where maize was first cultivated by humans, the grants committee is currently (2011-2012) interested in projects within the State of Oaxaca, Mexico. The application process is informal. Inquiries are welcome and may be made either in English or Spanish by email to any one of the committee members. 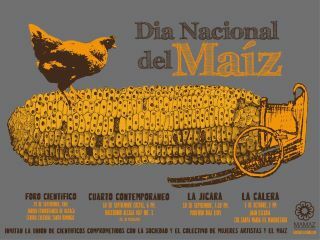 In the Fall of 2011 the Amaterra Agroecology Maize Project helped sponsor the Mexican National Day of Corn Scientific Forum and Art Exposition that was held at Oaxaca City, Mexico from September 29 through October with a grant of 6,356pesos. See details: Día Nacional del Maíz: Foro científico y Exposiciones Artísticas. The Amaterra Maize Project Grant is sponsoring the production of a stitched book, with design and stitchery by the members of the collectivo outside of Oaxaca. 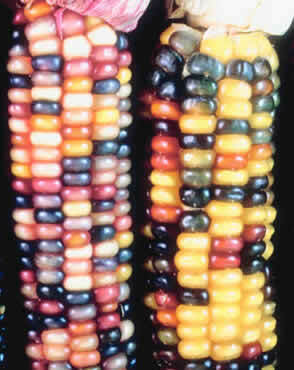 Current value of the initial grant is 6,321 Pesos.The theme of the book is the indigenous use and value of corn. Women of the collectivo at work in the picture at right.